There are items from my grandmother’s house that are now in my house. Actually, there are things from both grandmothers’ houses now resting comfortably in my house. One of my upcoming articles was inspired by one of those items. In the meantime, as I continue to do some research for that article, I thought I would revisit some of the memories that come with a couple of those other items. For as long as I could remember, there was a “B” and an eagle on MeMe’s and PaPa’s house. The “B,” obviously was for Bacon. The eagle? Well, that was probably because they lived on Eagle Street in Lyndonville. After MeMe passed away, my aunt lived in the house, with the decorations still proudly displayed on the chimney as they had been for so long. Around 2002 or 2003, the house fell out of the family for the first time since it was purchased by my great-grandparents in 1927. The new owners would likely get rid of those decorations. It seemed wrong to me to have such family history relegated to the garbage heap. It was a cold, fall day when I got to the house. With the urging of my great-uncle, Hank, I was going to take possession of the “B” and the eagle. I’m not sure why, but there was an extension ladder stored behind the house. With some tools borrowed from Uncle Hank, Wendy and I set about removing the decorations so they could be reinstated as family heirlooms at my house. Unfortunately, the “B” came down in two pieces. It had been up there such a long time that the screws were permanently rusted into the masonry of the chimney. Still, I brought it home with the idea of fixing it and putting it above my door, or on my own chimney. In the intervening years, I’ve tried to get that “B” fixed -- all to no avail. I made a pattern from it and cut my own version out of wood. Still, it never made it onto the house. Fast forward to Christmas 2017, and my wonderful wife has had a larger version of the “B” made for me as a gift. This spring, we installed it on the garage, continuing the “B” tradition. As for the wooden copy that I made, I painted it dark green to match the color of the roof of the house, and I am attaching it to the front of the pallet bar that I made (all by myself, which in and of itself is very impressive. If you know me, you know that’s true.) 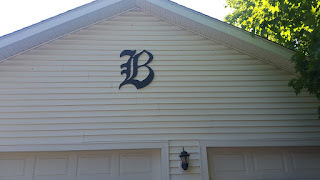 The original “B” will be stored with other family heirlooms so that it is not lost. And I will regale my children with reasons why it’s so important. MeMe also liked owls. (My daughter, Corliss, loves owls, too. It must be a family thing.) She had figurines of owls around the house. I think all the grandchildren got one. My sits on the bookshelf behind where I do most of my writing in the living room. It kind of looks over me while I write each day. Even these little trinkets sometimes hold memories from years long past. My grandmother used to have a couple of little signs above her kitchen table. I used to stay there a lot when I was young, and I would practice my reading with these signs. One of my favorite ones read, “If you’re so smart, why ain’t you rich?” I was obsessed with that sign. Even after I became a prolific reader, I would read that sign out loud whenever I sat down for lunch or dinner at the kitchen table. That sign hangs in my kitchen today. While it doesn’t hang over our kitchen table, it is in a prominent spot when you walk into the house. I glance at it every day. Each time, I tell myself that someday I’ll write a book about all those childhood and adulthood memories at grandma’s house, and that slogan will be my title. On my mantle there is a glass block bank full of pennies. When it was at grandma’s house, it was on a bureau at the top of the stairs at the end of the hallway. I used to look at all those pennies and wonder how much money was in it. For a little kid, even that bit of money seemed like a treasure. One of the coolest things we used to do would be to put in the first new penny of the year when I stayed over. Either of us would save the first new penny we got, and then when I visited, we’d put them in the bank. I haven’t done that for a couple of years, but I do have the pennies to go in there. I’m not sure there’s much room in there anymore. Wendy was given grandma’s sewing machine. 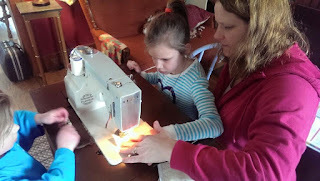 When I was a kid, the sewing machine was in the den, where almost all the sewing was done. My grandmother used that machine, as did my mother, and my sister. I may have used it a couple of times, but sewing really wasn’t my thing. Wendy used it, too, and now my kids have used it. There have been four generations of my family using that sewing machine. It was a special moment as I watched Patience work on that machine, knowing its long history. My grandmother had this amazing front porch on her house. It was all enclosed, and as soon as it was warm enough, she would very often be found sitting in her rocking chair watching the world outside. I’m not sure where she got that rocker, but it seemed pretty old even when I was a little kid. That chair made it to my house, too. Today, it rests in my side, enclosed porch. If the girls ever stop just dumping their stuff in the porch, we might actually be able to sit out there and watch the world go by ourselves. Each one of these things occasionally triggers some memory from times I spent at either Meme’s or grandma’s houses. I seriously could write a whole book on growing up around either of those houses. I’m sure someday that will actually happen. In the meantime, I have a great series of historical articles coming very soon that deal directly with one of these tangible memories from grandma’s house. I’m sure that we all have heirlooms and great stories about them. They are extraordinarily important pieces of family history. Cherish them always, and do everything in your power to pass those stories down to the following generations so their importance is never lost. I tell my kids stories from my childhood all the time. I’m not sure if they listen, but someday they will. Craig Bacon is simply a nostalgic person. Those memories often bring smiles to his face. Couldn’t we all use some more smiles every day?